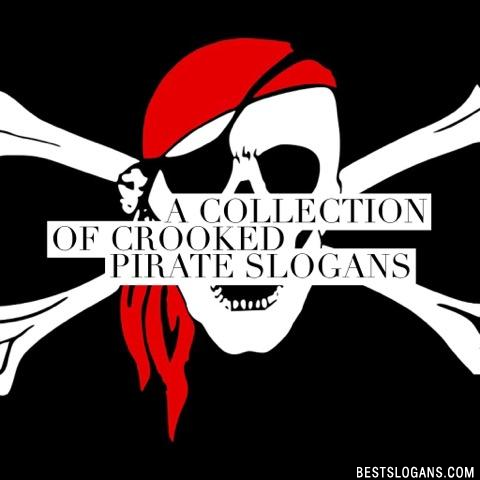 72 new entries added to pirates slogans, pirate slogans, that include pictures. 1. Ye can swab the poop deck, but ye can't poop on the swab deck. 1 Ye can swab the poop deck, but ye can't poop on the swab deck. 2 Work like a captain, play like a pirate. 3 Why are pirates better than every one else? 4 Where there is a sea there are pirates. 5 When a pirate grows rich enough, they make him a prince. 6 Walk the plank, wench, and then ride it. 8 To err is human but to arr is pirate! 9 There is something I must tell you...I am not left- handed! 10 There is nothing like the smell of cannon fire in the morning. 11 There is more treasure in books than in all the pirate's loot on Treasure Island. 12 The rougher the seas, the smoother we sail. Ahoy! 13 The existence of the sea means the existence of pirates. 14 The Dutchman must have a Captain! 15 The cure for anything is salt water, sweat, tears, or the sea. 16 Surrender will not be accepted. 20 Sailors tell stories, Pirates make legends. Can you think of a good Pirates Slogans we're missing? Or come up with a clever one of your own. Please share below.